If you have never towed a trailer, you may be some what reluctant to even give it a try. You may think it is just easier to call a friend. No matter what you decide to try to tow, your vehicle will become heavier, slower and will require a greater stopping distance. But, this does not mean you cannot do it. With the proper equipment and adjustments, towing can become as easy as normal driving plus you do not even have to call a friend to help you. Let this short blog give you a small Towing Basics. What do you plan on towing? It is important to determine which kind of trailer you plan on towing. 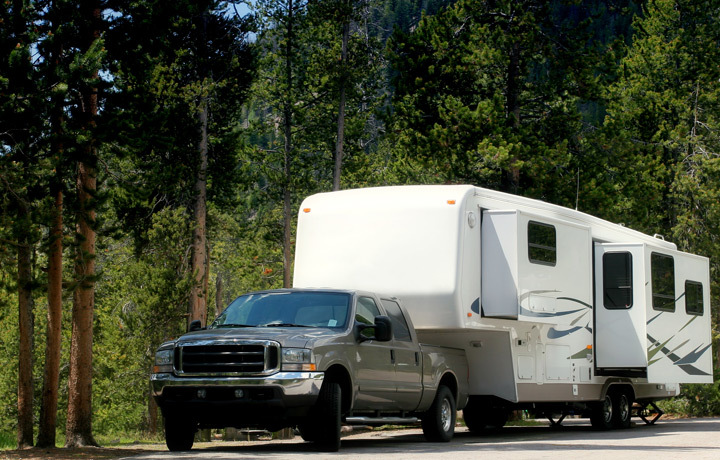 Are you going to tow a boat, camper or maybe something even bigger like a horse trailer? There are a variety of receiver hitches that range from a basic receiver hitch to a heavy-duty 5th wheel or gooseneck hitch. What will you use to tow with? Each vehicle has different capacities and each one will require a different type of equipment to tow safely and legally. So, whether you are using a small car or a Chevy Pickup truck or an SUV, make sure you get the right towing package for the items you plan on towing. Where do you plan on towing? You also want to make sure that you reach your destination. So make sure that you have the right vehicle and towing package for your ride. Keep in mind the distance you will go and the road conditions along your route. For example, towing a small utility trailer across town is completely different from hauling a horse trailer through the snow filled mountains. Important Tip: Never exceed the weight capacity rating of the lowest rated component on your towing setup. Click Here To Find Out More About The Supreme Muffler Shop Hitches.